No. 10: The Huskies will beat Auburn. Henceforth, UW beat writer Adam Jude kicks off the year with these big proclamations. With the No. 6 Huskies just four days away from their season opener against No. 9 Auburn in Atlanta (12:30 p.m. PT Saturday, ABC), here are some early predictions about how the season will play out for Washington. Some of the predictions are bold, some less so, and all will turn out exactly, perfectly 100 percent correct (that’s how this works, right?). 10. The Huskies will beat Auburn. Washington has unrivaled experience in the backfield and an elite secondary. Auburn will have a stout defensive front, a touted veteran QB and the advantage of playing close to home. It’s the college football’s biggest game of the opening weekend and the most important opener in UW history. Unlike their last trip to Atlanta, when they faced top-ranked Alabama, the Huskies don’t have to be perfect Saturday in Mercedes-Benz Stadium. They have to play a clean game, sure, but they’re strong enough and deep enough across the board to go toe-to-toe with a top SEC team. They don’t need all the lucky bounces to go their way. They do need to run the ball effectively — force-feed it to Myles Gaskin if they have to — and that means the veteran offensive line must lead the way. Prediction: Huskies 20, Auburn 17. 9. It’s Salvon Ahmed time. The Huskies’ most exciting player? Has to be Ahmed, the second-year sophomore out of Juanita High who should be at the top of everyone’s list of breakout candidates. He averaged fewer than six touches from scrimmage per game as a true freshman in 2017, gaining 6.4 yards per carry. He will still back up Gaskin, of course, but ought to get twice as many touches for an offense that needs another big-play option to emerge. Something like 1,500 all-purpose yards and 10 total touchdowns is not a stretch for Ahmed this fall. 8. Ryan Bowman will double his sack total. The dude never stops. A former walk-on from Bellevue, Bowman wasn’t on anyone’s radar at this time last year. Then the redshirt freshman gradually earned more playing time at the hybrid Buck outside linebacker position, eventually taking over as the starter late in the season and leading the team in sacks with 5.5. Get him near the QB and he’s relentless. He still played in just a quarter of the total defensive snaps in 2017, and a full-time role this fall (even with the Huskies’ frequent substitutions) should yield a double-digit sack season for Bowman. Junior Benning Potoa’e has also had the best fall camp of his career and will be counted on off the other edge. 7. Trey Adams won’t be UW’s only lineman to receive All-America recognition. Adams, returning from a major knee injury last October, has received preseason All-America honors from several publications. The 6-foot-8, 316-pound senior left tackle from Wenatchee is, no doubt, one of the most important players on the UW roster — the Huskies’ offense wasn’t the same without him on the field in the second half of 2017. But just as important to the Huskies’ success is Kaleb McGary at right tackle. The 6-8, 324-pound fifth-year senior from Fife was a first-team all-Pac-12 pick last fall and has started 30 consecutive games for the Huskies. Don’t be surprised if McGary winds up being the line’s highest-rated pro prospect by the end of the season. 6. The wide receivers will be just fine. They’re unproven, yes. They’re young, sure. That was what we were saying about the Huskies’ wide receivers in 2016, and it’s what we’ve been saying about them again this offseason. It’s probably not fair to expect the same sort of breakthrough from this group as the 2016 receivers had — John Ross and Dante Pettis were special — but there’s talent out wide, and those guys sure sound motivated to prove themselves. Aaron Fuller, Ty Jones, Andre Baccellia and Quinten Pounds will be Jake Browning’s top targets, and Chico McClatcher will eventually be too as he eases back into things coming off two major injuries. The Huskies will rely on a strong running game, and defenses will have to respect that — meaning there should be a lot of one-on-one opportunities for those receivers to make plays downfield. 5. The Huskies will lose on the road, but it won’t be at Oregon. Utah will be the Huskies’ toughest true road game of the season (if we’re really counting Auburn as a neutral-site game), and the early prediction here is the always underrated Utes upset UW in Salt Lake City on Sept. 15. It’s not impossible for a Pac-12 team to go through the conference schedule unscathed, but it’s close to impossible. Only once since the conference expanded to nine games (in 2006) has a team finished 9-0 in Pac-12 play. So the Huskies have that hurdle, that history, in front of them. They also have a recent history of dominance over their most hated rival, outscoring Oregon 108-24 the past two seasons. The Huskies’ visit Eugene on Oct. 13. The Ducks have an improved defense and one of the league’s top quarterbacks in Justin Herbert, who last season put up big numbers but did so largely against lesser competition (he’s 0-4 against ranked teams). Early thought here is Huskies will comfortably run away from the Ducks again. 4. Myles Gaskin will break UW’s all-time rushing record. OK, OK, this is hardly a bold prediction, considering Gaskin needs just 52 yards to eclipse Napoleon Kaufman’s 24-year-old school rushing record of 4,106 yards. How’s this? Let’s say Gaskin breaks it against Auburn. Still not bold enough? OK, let’s say Gaskin breaks in midway through the second quarter Saturday against Auburn in the middle of a touchdown run to give the Huskies the lead for good. Better? Gaskin has not only been one of the best backs in school history, he’s also been one of the most durable. The Pac-12 has never had a running back rush for 1,000 yards four times — count on Gaskin being the first. 3. Jake Browning will break UW’s all-time passing record. All right, all right, this is hardly going out on a limb either, considering Browning needs just 1,117 yards to break Cody Pickett’s 16-year-old school passing record of 10,220 yards. This is not where I predict Browning throws for 1,117 yards in the first half against Auburn … but he will probably get that record by the end of September, and by then we should see the “old” Jake officially back leading the UW offense. Browning wasn’t bad in 2017 — certainly not as bad as some of his critics make it seem — but he acknowledged he was often hesitant to trust his reads, and too often he fled the pocket too quickly. He’s learned, and he’s motivated, and the guess here is his final numbers this year will look closer to 2016 than 2017 — something like 3,200 yards passing and 35 total touchdowns. 2. The Huskies will win the Pac-12, topple USC in the title game and advance to the College Football Playoff. This, admittedly, is the glass-half-full outlook, but it’s hardly pie in the sky. The Huskies are the overwhelming favorite to win the Pac-12, and to get back to the CFP they almost certainly need a strong showing Saturday in Atlanta. They *probably* need a win to really impress the CFP committee (and bolster the Pac-12’s poor reputation nationally) but a good showing in a close loss isn’t the worst outcome either, big picture. Closer to home, Stanford should be UW’s biggest challenger in the North, and the Huskies get the Cardinal at home on Nov. 3 (though the Huskies will be playing their 10th game in 10 weeks before their bye). Beat Stanford and the Huskies will sail in the Pac-12 title game. 1. This secondary will be better than UW’s 2016 secondary. During the Pete Kwiatkowski-Jimmy Lake era, the UW defense has improved every season: In 2014, the Huskies allowed 24.8 points per game; in 2015, 18.8 ppg; in 2016, 17.7 ppg; and in 2017, 16.1 ppg. I expect that trend to continue. Budda Baker, Sidney Jones and Kevin King were all-time greats in UW’s secondary two years ago, and the 2016 UW defense led the nation in turnovers forced (with 33, including 19 interceptions). 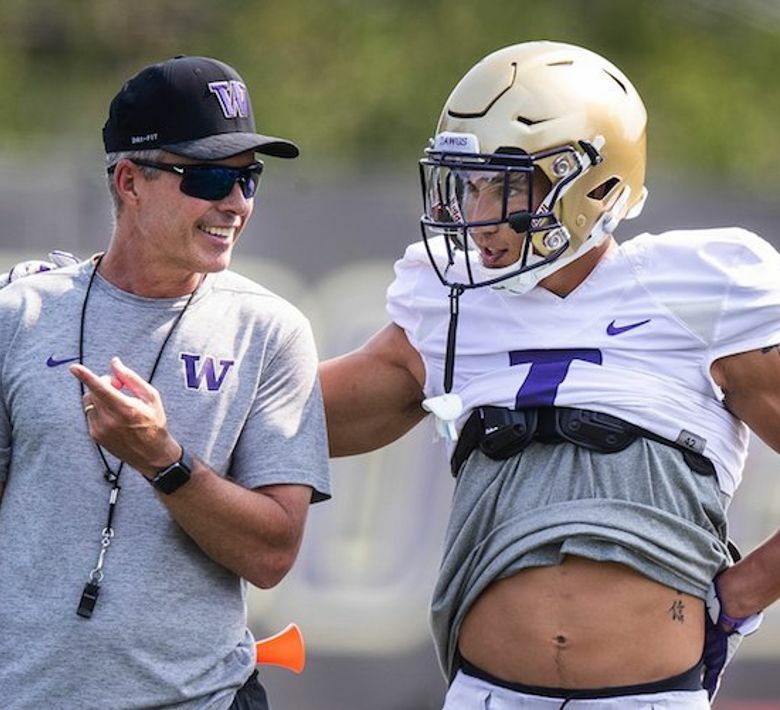 This secondary has similar top-end talent — with Byron Murphy, Taylor Rapp, Jordan Miller, JoJo McIntosh, Myles Bryant and Austin Joyner, UW essentially has six regular starters back from 2017. What separates this group is its depth. Sophomores Elijah Molden, Keith Taylor and Brandon McKinney are all pushing for greater roles, and freshmen Julius Irvin, Kyler Gordon and Dom Hampton all look capable of helping early on. You’ve heard it here before, many times — this secondary is loaded. And it will prove it in 2018.